Ecologel Solutions‘ Hydretain ES Plus Granular QD is a patented root zone moisture management technology. 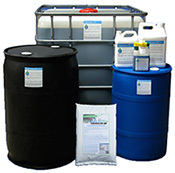 Hydretain reduces the overall watering requirements of plants, shrubs, trees, turf and agriculture by 50 percent or more. Hydretain ES Plus combines Hydretain’s root zone moisture management with an advanced naturally derived soil surfactant designed to improve penetration into and throughout hydrophobic soils.